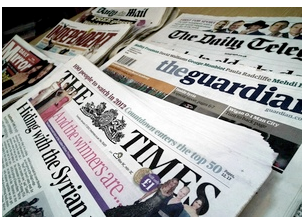 Media monitoring is an important activity for charities, but they have to pay to share copies of newspaper coverage with colleagues. The fees are collected by the Newspaper Licensing Agency (NLA), which is owned by the UK’s eight major newspaper groups. Each year the NLA raises over £26 million in copyright fees, of which about £1.3 million comes from charities – around 5%. The NLA’s running costs account for about a quarter of all that is raised, and the rest is distributed between 1,400 newspapers. Charities are paying to get their own coverage back. Our research shows that in the vast majority of cases charities copy newspapers to keep a track of the coverage they have generated, often as part of the requirement to show the impact of their work. Charities’ coverage is mainly local, but the NLA forces them to pay for national licences. Under the NLA’s licensing system, a charity has to pay for national coverage licensing even if it only has local or regional coverage. Media licensing is not cheap. Our research shows that it typically costs £1 for every article copied, and the largest charities are paying over £10,000 for media licensing. Why should charities pay when individuals can circulate articles freely? We think charities should be exempt from media licensing fees. We launched our campaign after researching the views of charities about the newspaper licensing system and their experience with the NLA. We presented the resulting report, Media licensing and charities to the NLA. Over 200 charities signed up to join our campaign. The campaign was covered in The Guardian, PRWeek and Third Sector. NLA managing director David Pugh responded – with a refusal: you can see his arguments in this piece in The Guardian. We visited the NLA in February 2012 to discuss our request but the response remained the same. We contacted all the newspaper groups represented by the NLA, but they kept to the NLA line. There was a moment when we thought that Northern & Shell Media Group might break ranks, but it decided against. We looked into taking the NLA to the Copyright Tribunal, but the potential costs were prohibitive. We produced A Beginner’s Guide to Media Licensing in the Charity Sector to answer some of the questions comms professionals ask when working out where their charity stands regarding media licensing and their media monitoring work. This includes suggested ways to reduce the cost of individual charities’ licences. In 2013, the NLA doubled its charity discount from £150 to a maximum of £390. While we felt that this was a positive step, it wasn’t enough. However, the NLA said this was as far as it was prepared to go. But did suggest that it might review the discount again, potentially in 2015.